Protect your public PCs from going out-of-order! 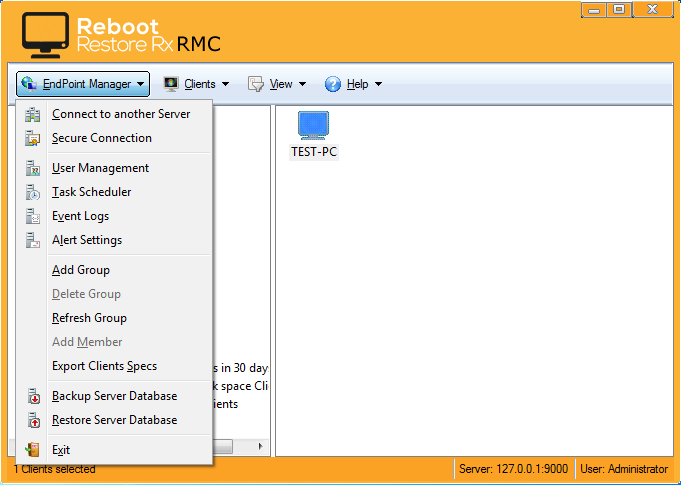 Instantly reset to the baseline on startup or hard reset. Update the baseline without restarting your computer. Drastically reduces computer maintenance, and can be used to protect tier one public access computing environments. 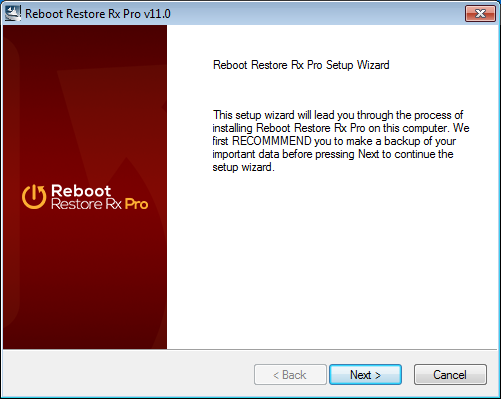 (Formerly Drive Vaccine) Reboot Restore Rx Pro prevents any and all changes made on your drive(s) making those PCs bulletproof and unbreakable. 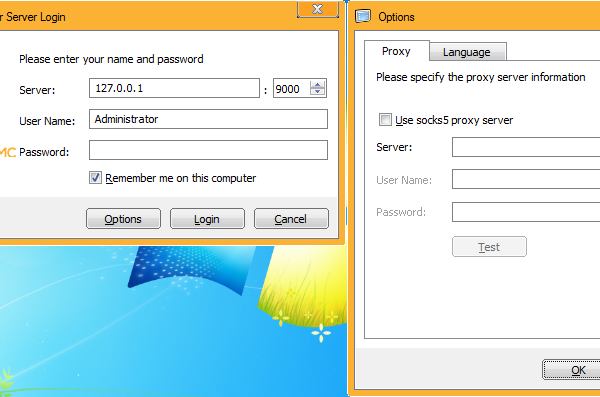 It is designed for public access computing environments such as schools, computer labs, kiosks, hotels, internet cafes, and libraries. We understand it takes a certain fortitude to service PCs in the public domain where users are not always careful and computer usage is high. 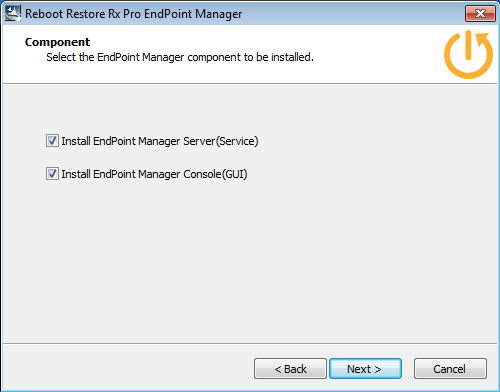 That is why we built Reboot Restore Rx Pro to be fast, effective and efficient. 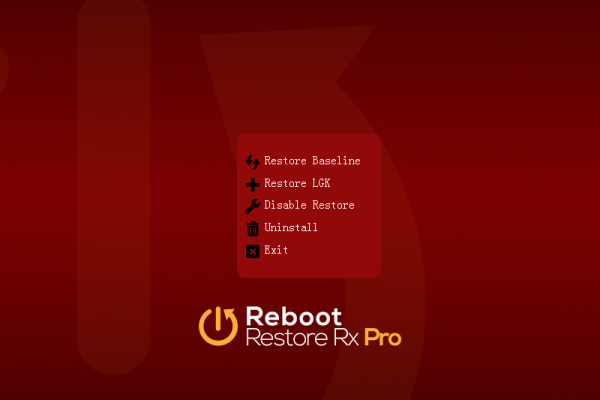 Regardless of what a user does (including erasing files, installing software or even hacking the system registry) Reboot Restore Rx Pro will automatically restore the PC to your desired system state on a schedule you set. 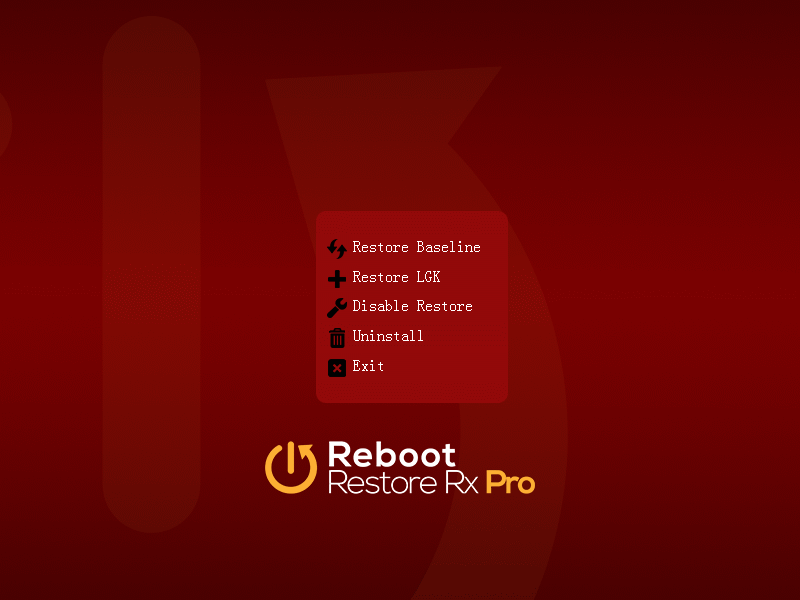 Reboot Restore Rx Professional integrates Reboot-and-Restore, a simple technology designed to keep computers fully functional and optimally configured. 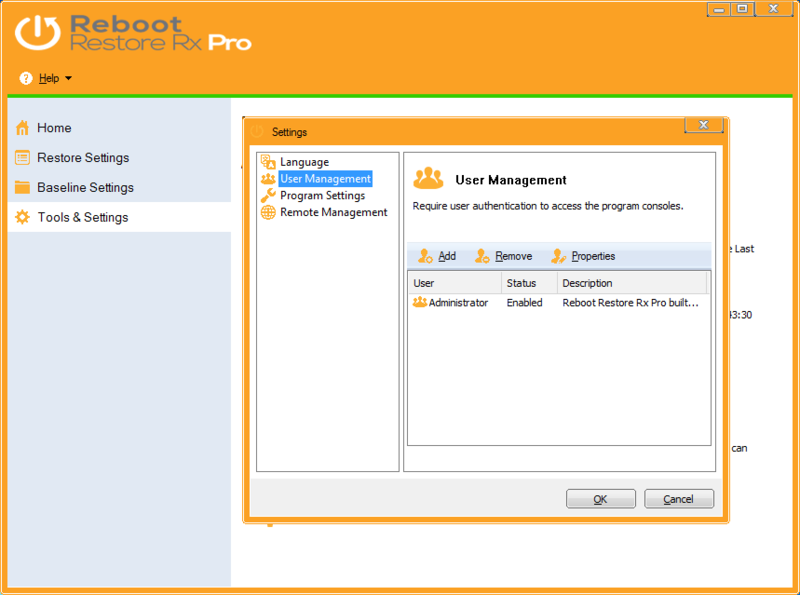 In addition to restoring on reboot, Reboot Restore Rx Professional can also restore on user Log-Off and can also maintain a safe “Immune Space” for file and data storage. 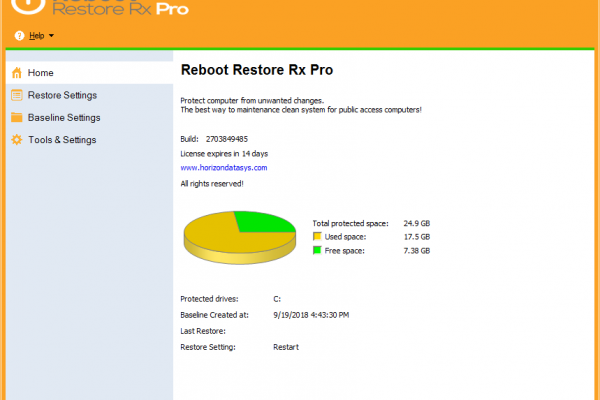 Reboot Restore Rx Professional drastically reduces computer maintenance, and is widely used to protect public access computers (ex. library public computers, school PC labs, etc.) or shared computing environments where a workstation could be damaged either intentionally or accidentally by a PC user. 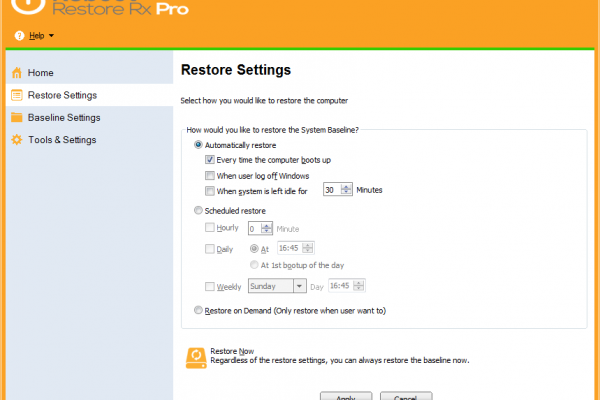 Reboot Restore Rx Professional (formerly Drive Vaccine) is a comprehensive automated PC restore utility that provides the right balance of functionality and robustness. Reboot Restore Rx Professional allows you to restore on reboot, log off, end-of-day, every hour, week, month — on any fixed schedule! 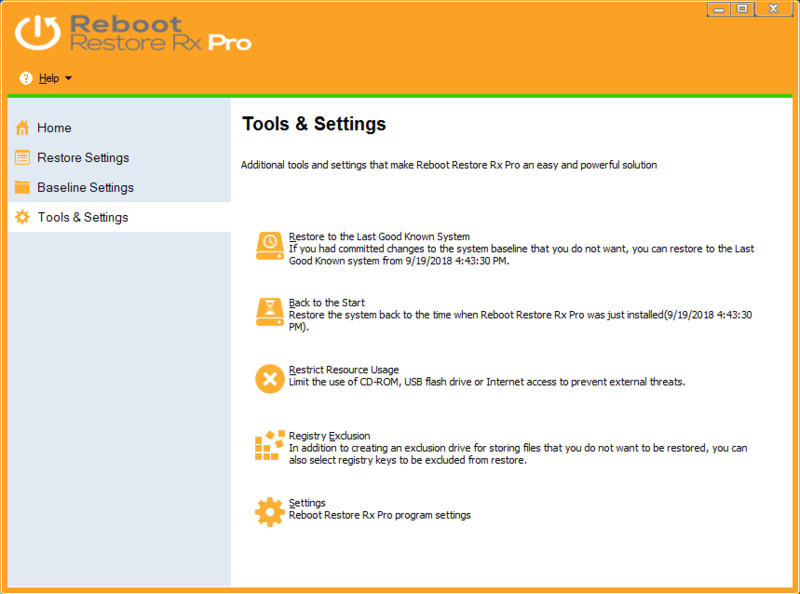 You can even set Reboot Restore Rx Professional to automatically restore when the PC is idle for a set period of time. 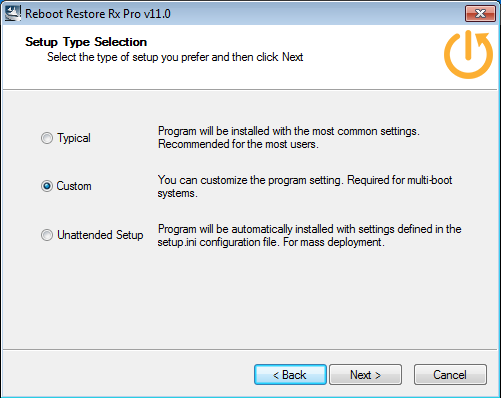 Reboot Restore Rx Professional sits outside Windows and functions at the sector level of the hard drive, not within Windows like traditional reboot-on-restore applications. 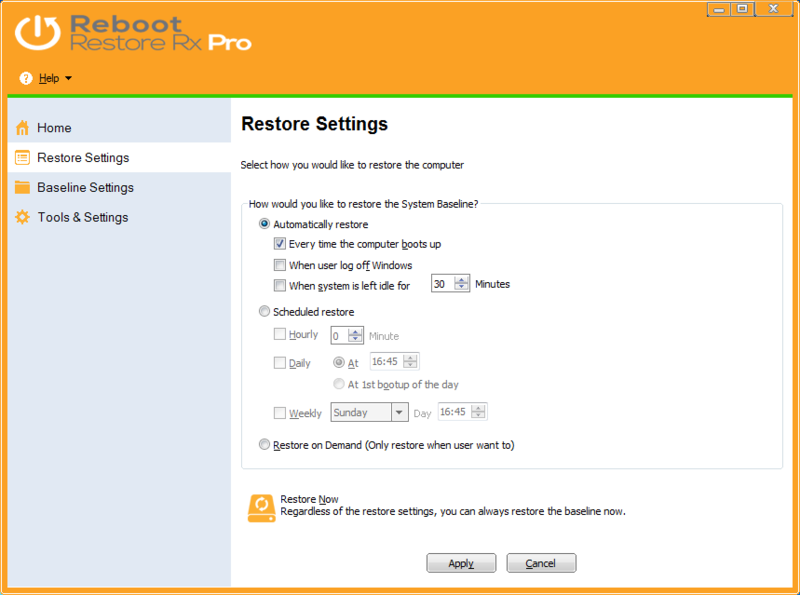 Reboot Restore Rx Professional protects the Master Boot Record (MBR), maintaining unmatched system integrity. 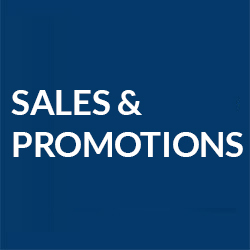 With its 256-bit AES baseline encryption you can be absolutely certain that your public access PCs are protected from ANY inadvertent or malicious attempts to make changes to the PCs. The days of having to re-image your hard drives — or worse — having to format and reinstall Windows constantly, are finally over! Imaging is a very time-consuming process. 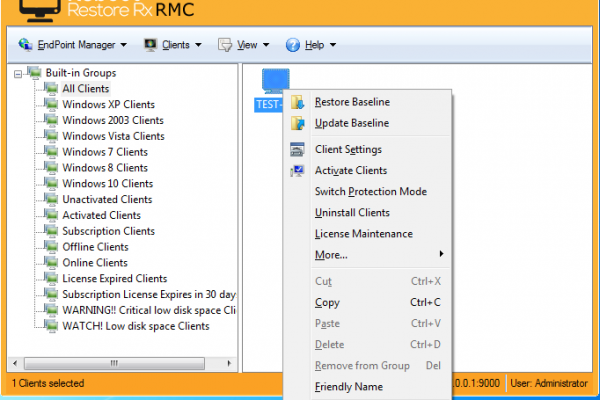 We bring the time required to restore your PCs down to seconds! 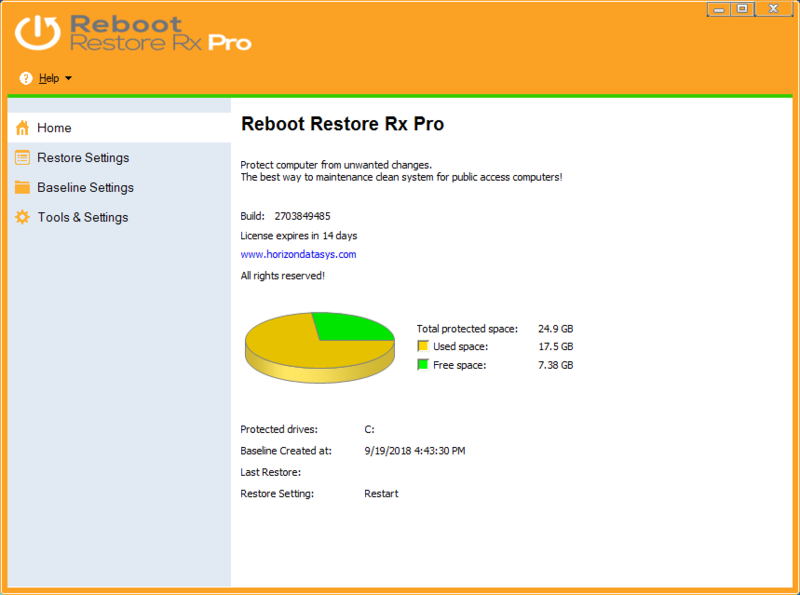 With Reboot Restore Rx Professional, you can easily automate the restore process. Preserving a computer’s configuration and automatically returning it to this baseline on any schedule. 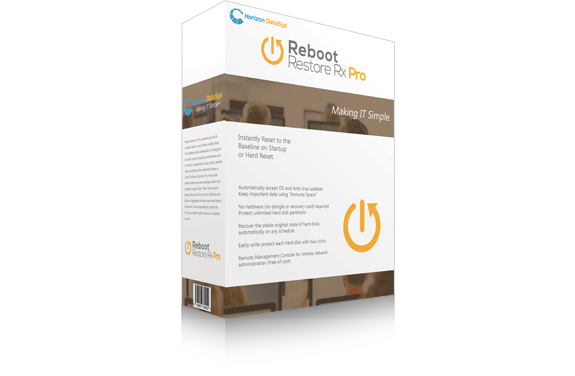 Reboot Restore Rx Professional ensures workstation performance is at optimal levels by removing website cookies, spyware, viruses and unnecessary plug-ins; which can cause system bottlenecks. 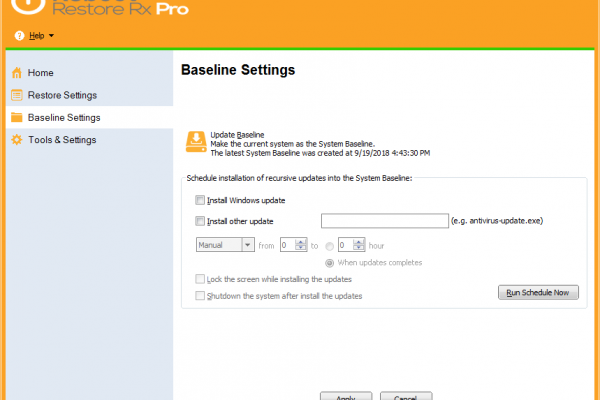 Any infections to a “immunized” system are instantly eradicated — workstations are reverted back to their original configuration on every restart, log-off or on any fixed schedule. Because Reboot Restore Rx Professional does not restrict access and is invisible to users, users feel as though they have complete control of the machine, enhancing the computing experience. Viruses and spyware are the most common threats, and new infections slip through the cracks daily. In addition, users can also cause inadvertent damage to PC’s by tampering with configuration settings, or by installing botched software. 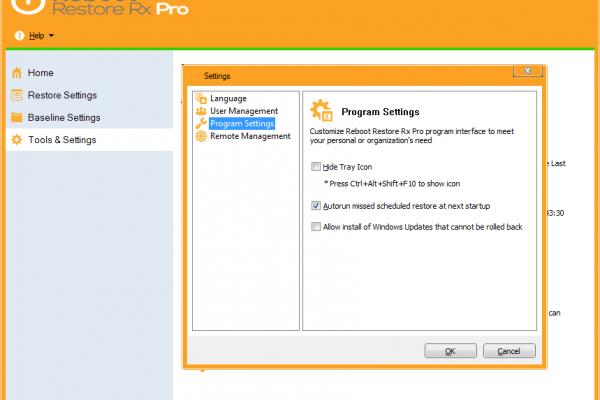 Reboot Restore Rx Professional (formerly Drive Vaccine) helps maintain a consistent baseline — free of any malware or system changes. 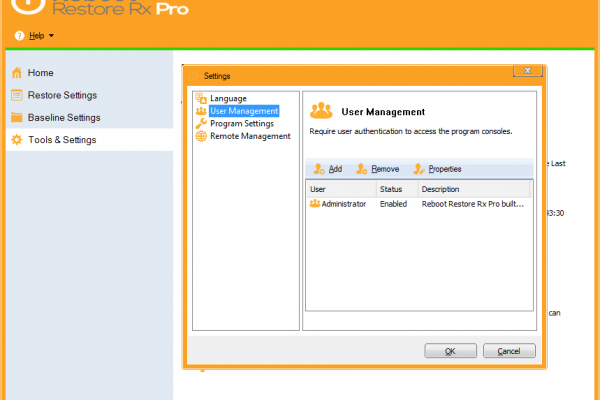 Put in force user policies by guaranteeing that only approved applications are installed on your organization’s PCs. 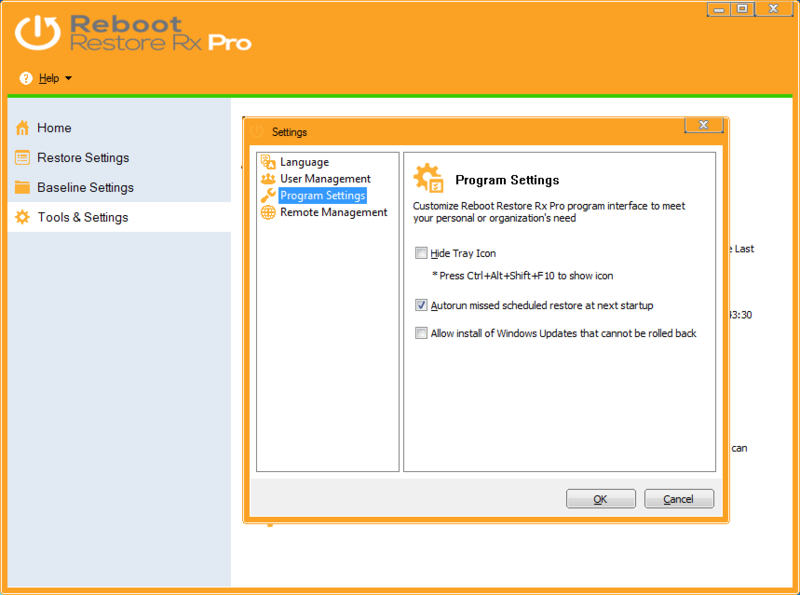 When protected, Reboot Restore Rx Professional will not allow configuration changes or installation of any applications to remain on the workstations. This — in effect — blocks the installation of most illegal or unauthorized software. 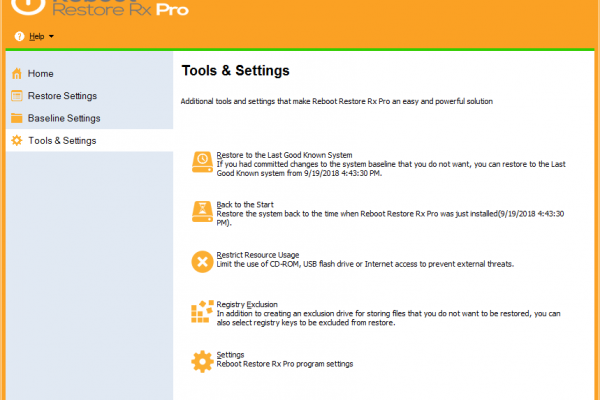 Reboot Restore Rx Professional offers the option to deny access to CD ROM and USB ports – preventing the use of external applications, root kits or data heisting. Administrators can create an “immune space” — a virtual drive space in order to save files and folders. 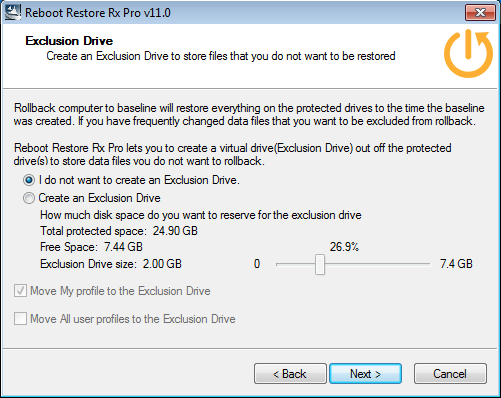 This enables computer users to save files and folders for permanent storage, keeping them exempt from the restoration process. 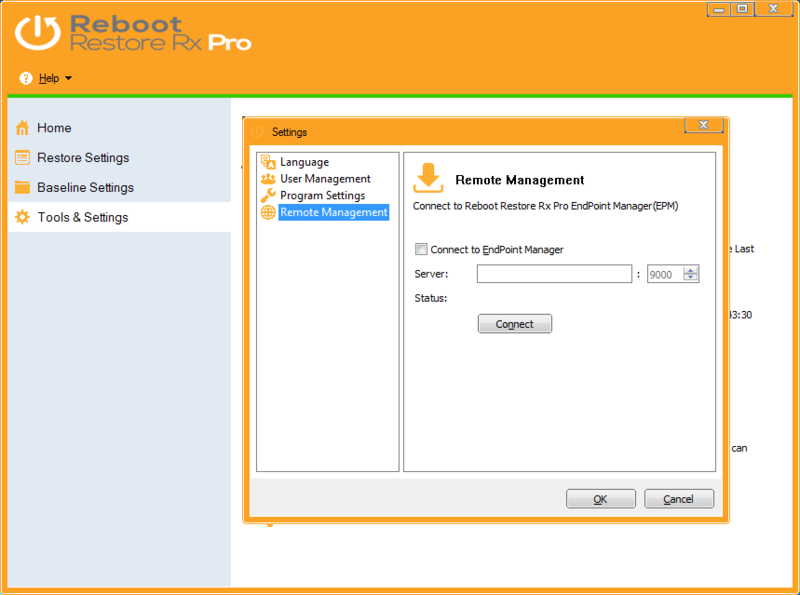 This integrated Immune Space ensures that student work files, such as documents can always be accessible even after Reboot Restore Rx Professional has restored the PC back to its baseline. 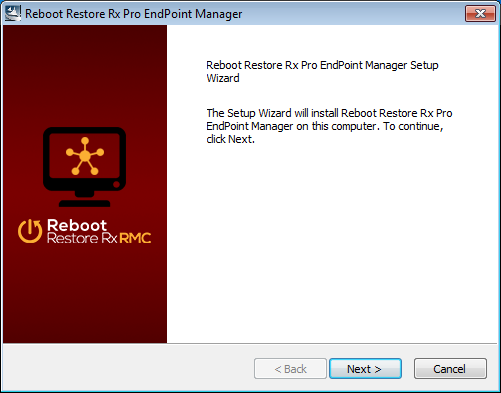 The Reboot Restore Rx Professional RMC (Remote Management Console) is a complimentary utility that is delivered to all clients that require remote management capabilities of their Reboot Restore Rx Professional PC installations. 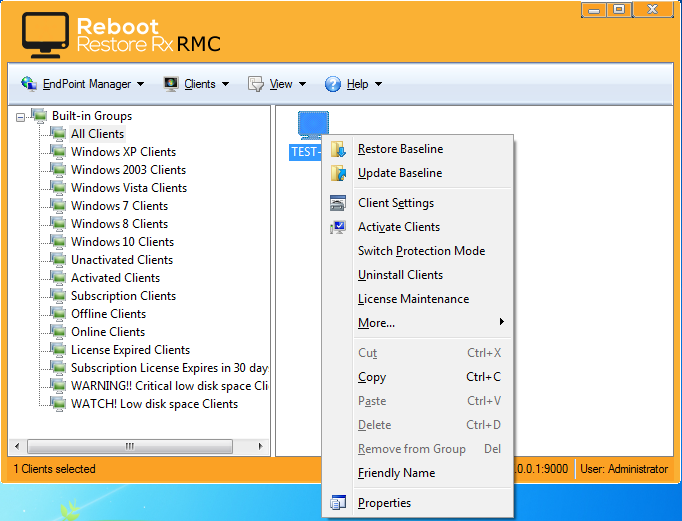 The Reboot Restore Rx Professional RMC solution delivers a complete client-server based network management solution for Reboot Restore Rx Professional PC client installations, enabling administrators to easily manage their client PCs from anywhere via LAN, WAN or over the Internet. Users in a public access settings are susceptible to falling prey to identity thieves. 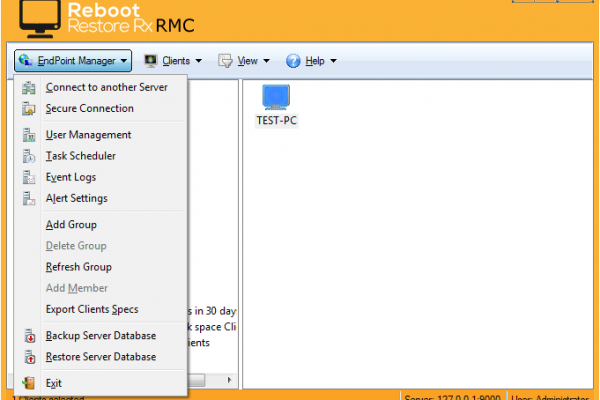 Some may attempt to pre-install a key-logger or some dangerous spyware application. Other bandits may attempt to view your history, temporary files — or worse — your completed forms; which may contain personal information, usernames, passwords, etc. 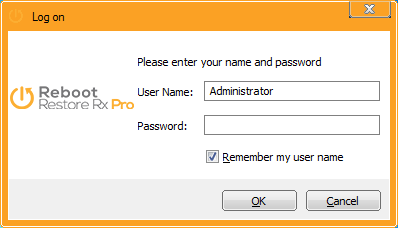 A system immunized by Reboot Restore Rx Professional insures users that no information or installed applications remain. 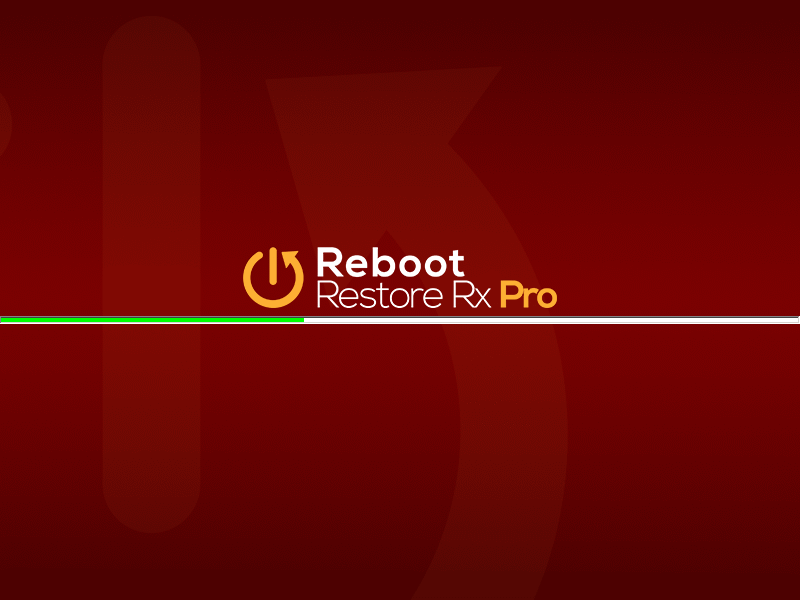 Reboot Restore Rx Professional erases any installed application, history settings, logs, and temporary files from remaining on the public access workstation so your privacy is protected and personal information is not cached and saved on the system for prying eyes to see.